Nikon Vision, a subsidiary of Nikon announced today the release of its Laser Rangefinder PROSTAFF 5—a new Nikon Sport Optics PROSTAFF brand model—with a progressive high-speed ranging system out to 550 m/600 yd. with 0.1-m/yd. distance display step. 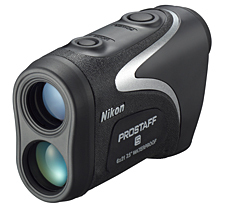 Laser Rangefinder PROSTAFF 5 features a stylish, ergonomic design and a sleek, palm-sized body. Subjects can be captured easily and immediately with the 6x multicoated lenses, large ocular lens and wider field of view. Distant Target Priority Mode enables easy distance-measuring, even when there is a wooded background. The Distant Target Priority Mode displays the range to the farthest target among multiple results obtained with a single measurement—useful in wooded areas. The LED illumination, which can be turned on and off manually, provides a bright display in dark conditions. Laser Rangefinder PROSTAFF 5 is easy to use and offers quick measuring for hunting and other simple survey measurements.